Since April 9th, I have spent exactly 70 minutes training for climbing. Prior to April 27th, I have climbed exactly seven times in the last five months. I just spent two days at the New River Gorge and exceeded my expectations, considering my almost half-year hiatus from regular climbing. Through a totally non-scientific process, I came up with the following ten-minute workout. Each minute I begin the task, and if I finish it before the minute is up, I can rest. If I can’t complete the task, I record how many reps I did. The first three minutes are an abbreviated warm-up. One frenchie in an L-sit position, holding each position for five seconds. Lock off at 90 degrees till failure. Using this workout, I could make a very limited time investment and track my returns. My initial gain was huge: 33-50% improvement in most areas over two weeks. I suspect, however, that all of that improvement was just getting back to my prior levels of strength. I wanted to improve at least one number every single time I exercised. I had seven different exercises to try, and plenty of opportunity to push one just a little higher. Since I was recording my progress and could see exactly how many reps I could do my last workout, it took zero mental effort to know how much I was aiming for time time around. I knew I was going to the New River Gorge soon. This trip happened over the weekend, and while I did not climb as well as I did when I was able to climb ten hours a week at the gym, I climbed much better than I should have for not being able to train on a wall for five months. I was motivated to train because I would be able to compare my strength against the real world of outdoor climbing. It wouldn’t be me vs. a door frame any more, but me vs. well-established routes at one of the best crags in America. I am now updating the climbing portion of my exercising. (Every other day I alternate training for climbing and Kettle Bell Swings) I will focus on more dynamic movement, and I’ll start adding weight. I am heading back to the NRG in a month or so, so I will get to give my “benchmark route” another attempt. The route is called Lactic Acid Bath, and it’s a steep route that, as the name suggests, easily generates tremendous amounts of lactic acid. I’ve tried it a half-dozen times over the years, always to be amazed at the sheer power and endurance required to send such a route. Late 2011 was the first time I was strong enough to do all the individual moves, and I was able to finish it. Mid 2012, when I was in very good climbing shape, I did it with one fall. That is the best I’ve done on LAB. This weekend, after five months of barely any real climbing, I was able to get to within three moves of my prior high point. (For those of you that know the route, I barely got to the knee-bar rest a few feet above the crux undercling section.) I was too tired to go any farther, but I was still tremendously pleased. The biggest breakthrough I have had recently is not specifically the training, but this method of training - building a workout and meticulously recording my progress. Without those meticulous records, I would not be able to see much improvement at all, and I would quickly grow demotivated and bored. I am now excited every time I get to work out, to try to push one or two numbers on rep farther. How about you? Do you record your progress with great detail when you train? If you’re at all like me, you don’t record that stuff - you’d rather just climb. 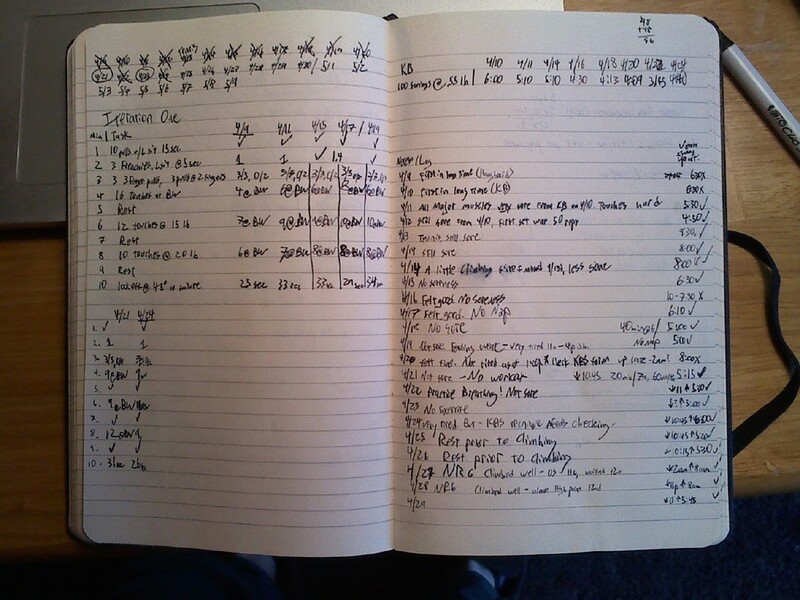 Do you think you should start tracking (in detail) your training?